Written three years ago but for some reason never posted. Half a century ago, when French food was being cooked up on television by Julia Child (a proper Bostonian), François Kissel (a true Frenchie) set up shop in a seedy soup kitchen at First & Yesler previously known as the Pittsburgh Lunch; he named it the Brasserie Pittsbourg. You'd descend a few stairs and be greeted by a glorious aroma unlike anything known to Seattle at the time: a billow of steam from the cafeteria line bearing a cloud of onions, rosemary, thyme, warm bread, and simmering chicken stock. Braised short ribs; veal chop with kidneys; sweetbreads, brains, beef tenderloin with tarragon-flavored béarnaise sauce; Provençal leg of lamb redolent with garlic. As part of dinner, a salad with a vinaigrette mixed by François behind locked doors (secret ingredient: sugar), and capped with a feather-light chocolate mousse. 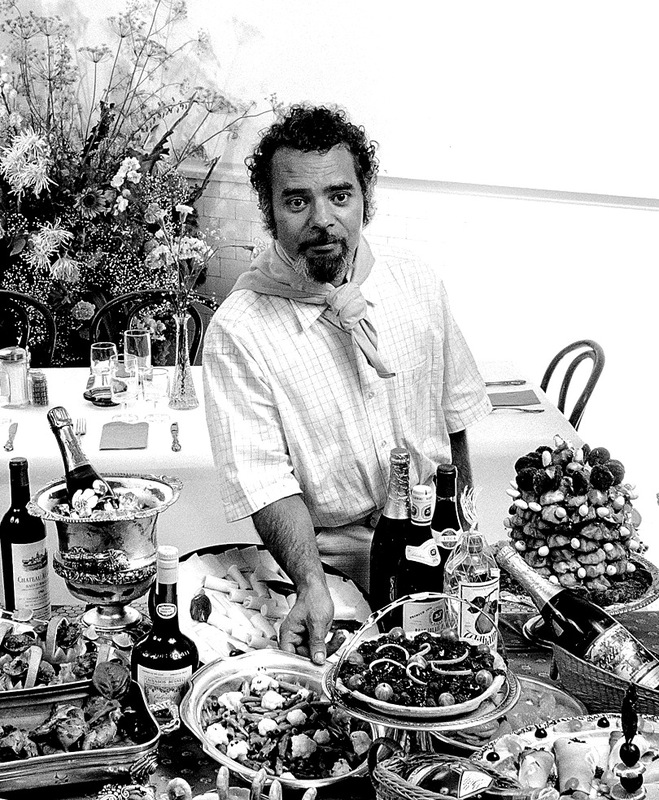 François and his wife, Julia, opened two more places (the City Loan Pavilion and Maximlien in the Market) before the Brasserie closed its doors in the late 1990s. The landlord transformed the space into an antique mall. François moved back to his family's village on the French coast where he received almost daily dialysis treatments until his death earlier this year. Photo © Bob Peterson. A house perched above Dexter Avenue was home, for many years, to an ambitious restaurant called Chez Paul, which gave way to a partnership (Greek-Croatian-Italian) called Adriatica. What a run it had! The view (until an office building got in the way) was almost as good as the panorama from Canlis; the food, by John Sarich, brought new Mediterranean flavors and techniques to Seattle. Yes, there was overreach: Dalmatia, in the Inn at the Market, failed to catch on. But Sarich went on to become the corporate chef at Chateau Ste. Michelle and developed an understated approach to Northwest ingredients that blended perfectly with locally produced wine. Adriatica itself fell into disrepair and closed for good in 2001. Le Tastevin on Lower Queen Anne was the upscale, celebratory version of the Brasserie Pittsbourg. The building was by Roland Terry, the same architect who put together Canlis. The operating partners were Emile Ninaud, a suave host who ran the wine side of the operation; and Jacques Boiroux, a genial and well-connected French chef. Together they hosted splashy, truffle-studded wine-centric dinners before their partnership dissolved, 20 years ago. Ninaud and his wife, Stephanie, went on to run a wine shop on Denny, Champion Cellars, until Emile retired, the building was torn down, and the business itself relocated to 85th & Greenwood, where it is thriving. Boiroux became a partner in the Metropolitan Markets chain. The restaurant became an event space called Kaspar's before it was sold for development as housing. Rover's, which looks like a modest house in a Madison Park courtyard, got its start as an amateur chef's weekend hobby; his day job was headmaster of the nearby Bush School, and the trustees finally pressured him to pay more attention to his schoolwork. Enter Thierry Rautureau, a Frenchman from Los Angeles looking for a new adventure, and for the next two decades Rovers became Seattle's temple of foie gras and formal French dining. Thierry (who goes by the nickname The Chef in the Hat!! !, complete with exclamation marks) eventually opened Luc, a less formal bistro around the corner, then succumbed to the siren song of downtown Seattle: he opened Loulay, a dazzling café in the Sheraton Hotel. Rover's passed into history; it is now home to Ayala, Seattle's only vegan Thai restaurant. In 1950, Washington's legislature changed the liquor laws, and suddenly you could buy liquor by the drink in restaurants. Peter Canlis opened a spot on Aurora, John Franco opened on Lake Union, Jim Ward opened 13 Coins, and Victor Rosellini (with his brother-in-law John Pogetti) opened Rosellini's 610 at the corner of 6th & Pike. Victor, born in Tacoma, had worked in several "Little Italy" restaurants in San Francisco's North Beach; when he returned to Seattle he had the elegance and bearing of a patrician. The 610 was a hit with the downtown business crowd, even more so was the Four-10 in the White Henry Stuart Building a few years later: waiters in tuxedos, starched tablecloths, heavy silver service pieces, steaks flamed table side. More than the locations, it was the Rosellini name (and welcoming personality) that counted, a tradition that Victor's son, Robert, never quite pulled off. This page contains a single entry by Cornichon published on November 24, 2017 6:00 PM. A Modern Thanksgiving Tale: How Whole Foods got gobbled up was the previous entry in this blog. On a clear day, you can drink forever is the next entry in this blog.